There are several “lead” options, question marks and just plain crummy plays in the bargain bin for this game. I think this game sets up better for some single entry double-ups than tournaments if you are considering only playing a couple lineups. Enjoy a special one week free of Awesemo Premium with promo code PRIMETIME. Join now and gain access to all of the projections, rankings, and expected ownership percentages you need to get ahead of The Masses in DFS NFL, NBA, NHL, PGA and more. Quarterback – Eli Manning is clearly no longer effective at anything more than short to mid-range passes, however, only Nick Foles did not throw a touchdown against the Falcons all the way back in the 2018 NFL Season Opener… in each of the five subsequent games, Atlanta has allowed the opposing signal-caller to throw for a trio of touchdowns – last week Jameis Winston broke that trend by throwing four. From an official perspective, Football Outsiders has the Falcons as the #29 passing defense per their DVOA metric. Manning is the fourth most expensive player on DraftKings and the fifth priciest option on FanDuel. While that is not a great price point, considering that Atlanta is allowing the fourth most passing yards per game (295.8) and the second most fantasy points. 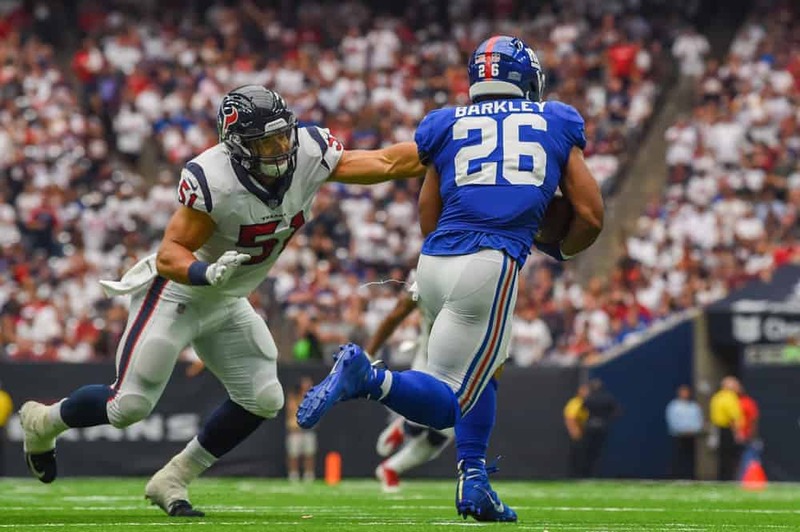 Running Back – Saquon Barkley has been phenomenal this season with 84/438/4 on the ground and 51 targets for 40/373/2 through the air and we know that Atlanta is allowing a league high 8.83 receptions to opposing running backs for the second most yards per game at 70.8 and along with 6 rushing and 2 receiving touchdowns. Barkley deserves strong consideration for the Captain/MVP designation. Wayne Gallman is an afterthought averaging about 10 snaps per game with 111 total yards and no touchdowns. Wide Receiver – As long as Odell Beckham can stay hydrated, he is in a great matchup… unfortunately his quarterback can’t get him the ball down field consistently. No worries, Beckham is solid at turning shorter catches into big gains though he does have as many passing touchdowns on the season as he does receiving touchdowns. Sterling Shepard has been quite with just 14 targets for 7/112/0 over the last two games, but we have seen him have big games as well with 10 targets for 10/77/1 in Week 4 against New Orleans and 7 targets for 6/80/1 during Week 3 in Houston. The remaining receivers are not very interesting and they have combined for 23 targets for 12/196/0. About half of that production belongs to Cody Latimer who has been placed on the injured reserve with a hamstring injury – that means that potentially Russell Shepard will see the slightest of opportunity upticks. Tight End – Scott Simonson saw 97% of the snaps last week with both Rhett Ellison and Evan Engram inactive. That pair should both be available Monday night, which makes things crowded… if we are putting Saquon Barkley in our Captain slot on DraftKings we will need some savings and there is a decent chance that Evan Engram will be overlooked (as much as one can be overlooked on a single game slate) since he last saw action in Week 3. Defense/Special Teams – Despite having a less than stellar deep ball, Matt Ryan has only been picked off twice, but he has been sacked at least three times in four of the six games thus far. Sadly the Giants are dead last with SEVEN TOTAL SACKS on the year. Quarterback – Matt Ryan is on pace to top 5,000 passing yards and 30-35 touchdowns and he projects to be at the top of the scoring list along with Saquon Barkley. The Giants have been solid against the pass allowing only Carson Wentz and Deshaun Watson to throw for more than 250 yards. Advanced metrics tell a different story with New York checking in as the #27 passing DVOA per Football Outsiders. Because the Giants are not able to considtently put points on the board with only two games where they topped 20 (27 @ HOU in a victory and 31 @CAR in a loss), opposing teams have not had to keep their foot on the gas. Atlanta is 2-4 and on the verge of falling out of the playoff hunt, so they need to make sure they end the night with a victory. Running Back – Devonta Freeman is on the injured reserve and he just had surgery for his groin injury. Tevin Coleman has not seen a bump in his production and it has become close to a 60/40 timeshare with Ito Smith. We need them to find the end zone to be relevant in this game and I personally would prefer to look to the receivers. Wide Receiver – Julio Jones has 69 targets on the season for 44/707/0 with the big story being that he has yet to find the end zone. Calvin Ridley has been the beneficiary of the touchdowns leading the league with half a dozen though nearly half of his production came in Week 3 against New Orleans when he posted 7/146/3 – for comparison he has 33/349/6 on the season. Which gets us to my preferred option of Mohamed Sanu who is often the forgotten man – the main concern with Sanu is a lack of upside as the 3rd round pick in the 2012 draft has topped 100 yards receiving just thrice in his career. It should be noted that the Giants have allowed the second fewest fantasy points per game this season to receivers, but they have not really faced a team as truly pass happy as the Falcons. Tight End – Austin Hooper is basically fourth, fifth or sixth on the totem pole for fantasy opportunities – depending on how generous you are feeling and it is hard to recommend him outside of a differentiation play – and I would prefer to go with his counterpart on the Giants, Evan Engram. Defense/Special Teams – through six games New York has allowed 20 sacks, 5 fumbles and 4 interceptions. Sadly Atlanta only has 10 sacks on the season, but I will still be looking to them against Eli Manning. Summary – Despite the high projected point total, there are so many question marks – which should make this a fun single game slate. How do Julio and Odell only have one combined touchdown, will Calvin Ridley keep up his ridiculous touchdown rate, just how many dump passes can Saquon Barkley get against the porous Falcons defense, will Eli Manning be fantasy relevant and has anyone filed a missing person’s report for Tevin Coleman yet? Man, Beckham MVP! Who would’ve known. MAJOR squeaky wheel. Quick question: How much do you diversify your ups? I put in between 5-60 line ups and I’m not sure if I should spread my eggs around, so to speak, or all in. Sorry about my last comment! For me it depends on the slate, last night I felt more people would be on the key players so I did a couple of single entry contests both 50/50 and GPPs – additionally, I have been having some fun in the low dollar contests and with this particular game shaping up to see A TON of Barkley at the Captian/MVP spots. I made my DK lineups in the low dollar contests without him in that slot and in many cases not even on the team – this was to “gain some leverage” against the field in the event he did poorly – he did just fine with all his receptions and the late touchdown, so it didn’t work this time – though heading into the fourth quarter I was looking good and if it had been a quick/low scoring period, then the strategy would have worked out nicely.